With enough education and encouragement to skip his junior year of high school, M. Avery Johnson graduated a year ahead of his class with the hope of getting started on a bright future. Months later you could consider it as luck to have such a young African American male working in the White House and surrounding executive buildings. His work location was honorable, but his position showed no room for advancement. So, continuing his education part-time was his next step up in life. But…none of this seemed to be good enough when stuck in a sick system of senseless and shameless power that sentenced him to seventeen years and seven months in prison. 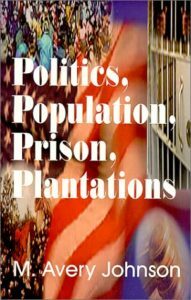 With a mix of education, common sense, rational thinking, and tough love, M. Avery Johnson uses facts and feelings to expose and express the people, power, pressure, and problems between Politics vs. Population vs. Prisons vs. Plantations.